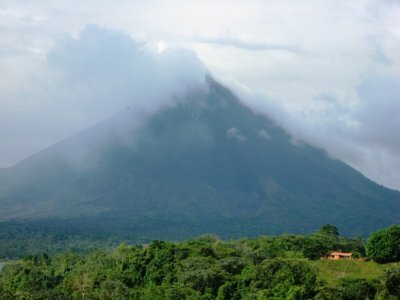 The horseback starts at the foot of the mountain near the Arenal Springs Resort Hotel and goes up through secondary forest and cattle fields as well as crossing through a beautiful primary forest area that ends up at a pretty iris lagoon. 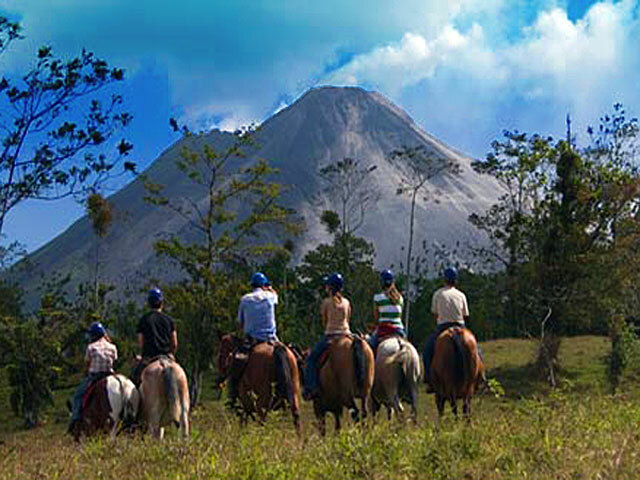 At the lagoon the horses rest before continuing to climb to a great Arenal Volcano View point: the closest point to the Volcano that is permitted. There will be time to absorb the view and take plenty of photos! Tours are at 8.30am and 1.30pm (with pick up from hotels around 8.00am and 1.00pm) and includes transport. Tours include transport but there is an extra charge of $15 per way to pick-up at the Observatory Lodge and other hotels outside the pick-up zone. 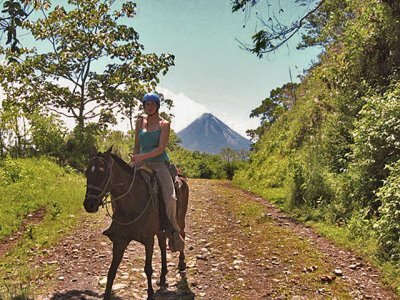 Horses in Costa Rica are small compared to those in Europe and the USA, hence there is a weight limit of 195lbs. The horseback rides differ depending on the number of people, ability etc but on average the tour is about 3 hours with transport and the break so you are on the horse about 2 hours. Kids less than six years cannot ride by themselves, only with parental authorization. Includes: Guide, Safety equipment, drinking water, delicious fruit punch at the end. What to Wear/bring: Long pants,T-shirt, Binoculars, Camera, Sun lotion, Repellent.